Is it important to become thin to do contemporary dance? 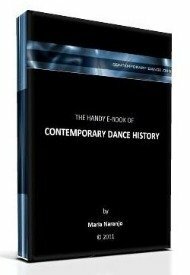 I have talked in several of my answers about the wide field of expressive and creative possibilities of contemporary dance. Considering that this type of dance is an art that works over unlimited subjects, matters, or questions; that it is sometimes theatrical, sometimes visual (as in fine arts) and so forth, my answer to your question is NO. The value of a skinny body is an important attribute for current fashion or marketing practices, though contemporary dance is neither one of those. I know that people is used to think about dancers as thin people, because they are indeed most frequently like that. But, this is usually a consequence of our daily practice, as we are moving constantly and that makes us spend a lot of energy, and eventually loose weight. The need of being thin is more a condition that applies to ballet, in which that specific visual attribute of the dancer's body is really highlighted. Contemporary dance does not give such an importance to this, and does even reject it in some of its creative proposals or ideological trends. Being thin is not a need for being agile neither. I can tell you from my own experience that I have had dance colleagues that were really overweighed and had more acrobatic skills than the rest of the group. Though, that is not a rule either, and the most common thing is that if you have a healthy body weight, you will also have a better domain of your physical abilities. You should not feel restricted to dance if you are a little overweighed. Once you start, you will see that the main sense of dance is MOVEMENT; not the body, nor stereotyped images. Art has commercial needs indeed, and therefore you might feel that having the body of marketing is a requirement to join contemporary dance professionally. Somehow that is true, but art also has its ways to win those kinds of battles. If you intend to practice as an amateur, you should absolutely not worry about this matter. If you decide to assume practices that lead you to loose some of your extra weight that will be great for your health. But be sure that the aesthetical demands of contemporary dance will not demand from you to be thin as an essential condition. In my opinion, we do not need a thin body to perform contemporary dance, but having a thin body will give you more visual appeal while performing. This is the only reason it is said that you should need a thin body to dance. In comment to what Annie said, I don't think that's true, your weight or any other attribute to your physical characteristics, shouldn't matter unless it keeps you from dancing. What is visually appealing is how well your body moves to whatever your dancing too. That's what people come to see and that's why people become dancers, for the dancing. Yes, you can start dancing contemporary if you’re eleven. But you should take classes of a beginner’s level. Ask your teacher for advice and follow a regular process. So to start off the list, first of all I'm definitely not flexible at all. Second, I'm not exactly tall(maybe only 5ft) and I'm pretty sure I'm never gonna grow again( trust me I've been trying.) Third, I'm not skinny. I'm unmistakably healthy, even though I barely even want to eat. Can I still dance? Yes. You can dance. But you will only know what you can achieve if you try. I really want to do contemporary dance, with all of my heart, but im overweight, so it scared me a lot. I constantly thought i could never do it, that everyone would reject me because im 14 and overweight. but now i don't fear it as much, so i would like to say thank you, and i hope i meet people like you when i start *which should be the beginning of next school year* My parents are supportive of it, and i'm really happy about this, so thank you.